I was having some trouble trying to decide where to focus my attention on the blog in 2014, when out of the blue my 8 year old son brings me a piece of paper with some writing on it. He’d found it in one of the books he’d inherited from his older siblings and I’d never seen it before. It was my daughter’s (16) handwriting and when I read it, it took my breath away. My daughter must have been about 8 years old when she wrote that. It makes me so happy to know she felt that way. I immediately knew that that’s what I wanted for all of you….that feeling of walking into your home, exhaling and saying Ahhhh! home. Doesn’t that sound grand? None of that says Ahhh! home to me. I think it’s time we changed that, don’t you? It’s time to create sanctuaries in whatever spaces we’ve been blessed with big or small, house, apartment or condo, owning or renting. Whatever the situation, what if we could be content with what we have right now? What if we could turn clutter and chaos into uncluttered and calm? What if when we walk in to our homes we felt at peace and comforted by our surroundings rather than frustrated and discouraged by what we see. It is possible you know, it most definitely is. 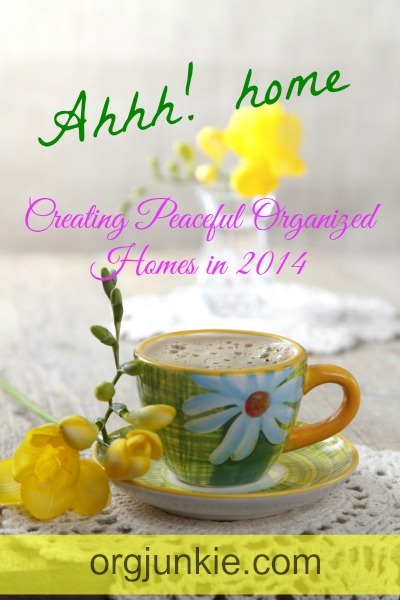 Will you join me on this journey to loving our spaces and creating peaceful organized homes in 2014? Will you respond in the comments by sharing what one word you would use to describe your home now and the one word you wish your home reflected instead? I want everyone to be able to walk into their homes and immediately think “Ahhhh! home”. Wouldn’t that be a beautiful thing? I have an almost 2 year old and almost 4 year old, and I feel so stressed trying to keep up with basic housework that I feel like I never have the time and freedom to enjoy them. I’d like to keep plugging away at those projects, both small and large, that make our home prettier, cleaner, more organized, and more comfortable. Sanctuary…….. My home is my sanctuary, in every respect. It is our home, nest, place of love and comfort. Our sanctuary………. Ahhhhhhh! Cluttered….. I am the pile queen–piles everywhere. I would like my home to be simply peaceful. 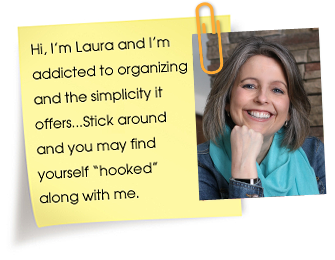 With my ADD I am disorganized which makes me uncomfortable about inviting anyone over. I am queen if piles! Stuff everywhere and it’s overwhelming and disorganized. Your blog is always a source of inspiration. We think very much alike so I can always relate to what you’re talking about. Thank you for the time and effort you put into your blog and for caring for those you have never met. Very well written blog article. Thank you for encouraging us and challenging us. I need to explain – My home looks nice and inviting. But if you look in my secret places like the lovely decorative storage boxes or under the gorgeous table with the ruffle skirt or even the dryer at times (I once stashed some unclean dishes in there when company arrived unexpectedly! ), it is an unorganized stash of craziness. Guest may walk in my home and say, “How inviting!” But I want to walk in to my house and say “Ah…home” without the voices reminding me of hidden messes and the guilt of procrastinating to take care of it. Our home must be inviting because lots of people seem to enjoy popping in on us for coffee or lunch! I feel it is cozy and warm and that its furnishings reflect who we are. I joke that the living room looks like the Day Room of a home for Seniors but that’s ok; we ARE Seniors! The one word I’d choose to describe our home is “DELIGHTFUL”. I am sooooo very grateful. 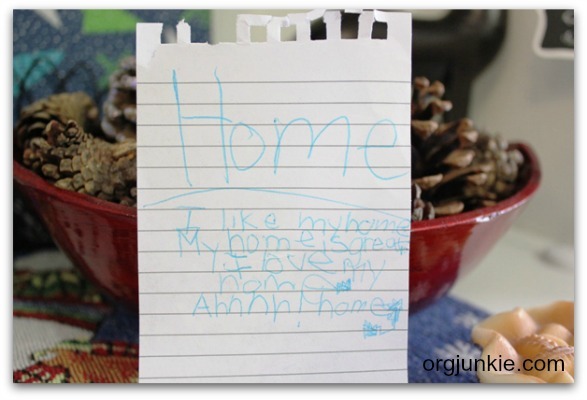 What a wonderful note to find from your child (sign that you’re doing an amazing job!) and also what a great theme for your blog. 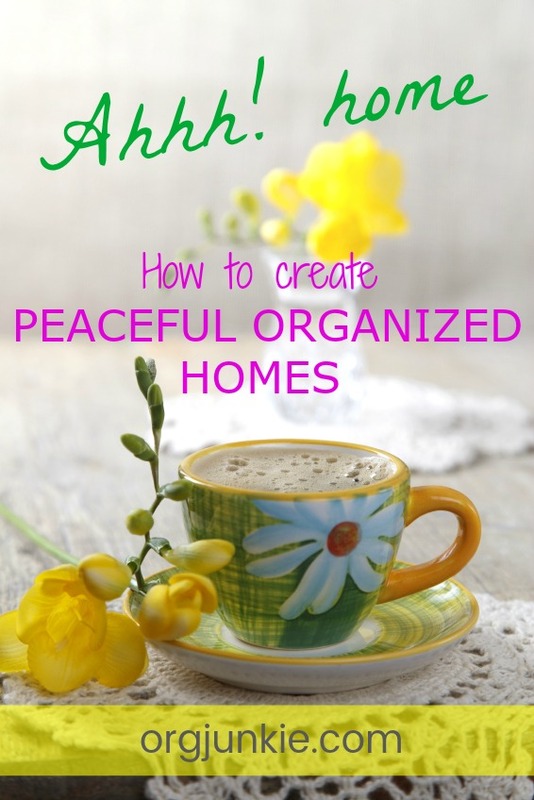 So often we focus on “just organizing” when the real goal is to have a peaceful home. Thank you for sharing the note. Wishing you a wonderful 2014! So sweet! Have you heard of Apartment Therapy’s January cure? It’s all about curing your home in the month of January. I usually don’t participate because my January is crazy at my day job due to year end closing but I’ve decided to this year. Hopping over from Smart & Simple Matters, listening to your podcast with Joel right now. Oops forgot to include my two words. That poem is awesome! I am totally in on this! To help me work towards that goal I am getting rid of 365 things this year and posting about it on my blog. Thank you so much for your continued inspiration! I’ve been back to work for 18 months….it’s been a while since a picture of my dining room table appeared on your blog. Many more possible changes this year…..but most of all I want a ……Refuge. A cluttered mess! Would like it to feel comfy, warm, inviting and organized. I’m excited for your input and assistance as 2014 is the year I will make this happen! I’ve been wondering what wonderful inspiration you would have for us in the new year 🙂 the last few years you’ve motivated me to tackle things I had been avoiding, helping me to make life better for my family. And you have not disappointed! This is just what has been on my heart. Thank you, Laura. It’s going to be a wonderful year! Now: cluttered, unorganized, too much stuff! Then: less stuff so I can have a clean, organized and peaceful little home. I want the opposite of what it is now…. An Ahhhhhh relaxing home!!!! Due to two small kids: chaotic, but full of love. Now it is Cluttered and I would like it to be relaxing. Hmmm, right now my one word is stuff (aka, too much stuff). The one word I would like for it to be is open. Oh and warm…really can’t have one without the other in my opinion. I don’t want my “open” to be sterile because that is one of the first things to come to mind when I use that word so I have to match it with warm. Hope that is not breaking the rules too much :). We just moved 12/22! So the goal is a sanctuary for the family! So very overwhelming! I have the most terrific organizing ideas and most of the products needed to complete the organizing projects, however I also have a very large family, a disabled husband, and three elderly relatives for which I provide much care. I’m an only child, as well as my husband, and we have no other family to help us. I just need encouragement and support to keep moving forward and to lovingly give to these family members all they need. First, however, I have to find my keys, step over the pile (many) of clothes, remember where I placed my purse and then try to figure out why my wallet isn’t in there…and then once I get out the door to start my day, wish that I would have put gas in the car before the blizzard arrived…where’s my coat??? our family is me, DH & 4 kids (3yrs to 13yrs) & we’ve gone from a relaxed, company-enjoying, active couple to a stressed out, overwhelmed, never-have-company, stay-at-home-to-hide, buried-in-mess family & I am at my whits end 🙁 help! 1. To feel like “there’s NO place like home” without a huuuge sigh & eye roll after! 2. To have friends and neighbors look around in amazement bc they can SEE my finished crafts, and Primitive deco, and let that be why they say Wow…followed with “Its sooo cozy in here, I can see how u can hang out at night and do ur crafts”!!! So, thanks again for waking me up from the nightmare of being a future Hoarder show, and mayyyybe a DIY magazine cover…hey, one can dream, right??!! Lol! ???? Oh, and OMG I can sooo relate to what Suzane wrote about tripping over piles of clothes, box of drying crafts, shoes, and the general I HAVE NO CLUE WHAT TO DO W THIS STUFF, BUT its important papers I can’t toss yet, to the bottomless pile of coupons that expire before I even reach halfway thru, to the pile of Uhhh,WTH ISSS this crap anyway, and WHYYYY do I save this juuuunk!! And then there’s also the totes of stuff my child has outgrown that I sell on CL site or FB uard sale sites that I do well with…when I can stick w it on a constant basis…between taking care of my son alone, looking for another job BC mine ended when my private duty clients family decided to mover her 2 stayed away to be closer to family. And, the endless apts daily, and my son dealing w his dad living apart from us right now, having anger issues regarding it, and lashing out at school to where I have to go get him, and my mother demanding to have me come clean her house 1x a week BC I’m out of work & can’t pay her the weekly loan payback amount like I did when I was making $18 an hour, to zero income!! So, ya, I lose keys, have to put EVERYTHING back down to find them, pick it allll back up,head to door and wait…what did I do with my stupiiiid phooone?! Ughhh…!! Lol! Its so so so so helpful knowing I’m not alone in this! On top of it, I have ADD, and thankfully my medication helps…when I REMEMBER to take it ???? My home is organized and decluttered which makes it very cozy, comfortable, and welcoming. I’m looking to bump it up a notch and add those extra special things that would make it into a sanctuary or retreat like place for my husband and I along with our family. I would like to have that bed and breakfast feeling of being pampered. Upstairs is à stuffed garage! Only THE nessasary stuff on THE updatings rooms, please? I currently live in “a house.” I feel overwhelmed when I come through the door everyday. After our 12/29/13 wedding, moved into my husbands house…….total bachelor pad. As Steph said above, MANCAVE………..I would like less manly and more ahhhhhhh. We have been trying to redo our kitchen for a year and had other major works done, so I’ve constantly been cleaning up after tradespeople and dust. Not much time for organising really. Just patching up after major problems. Now all big problems are done, so hopefully can get back to being a home.